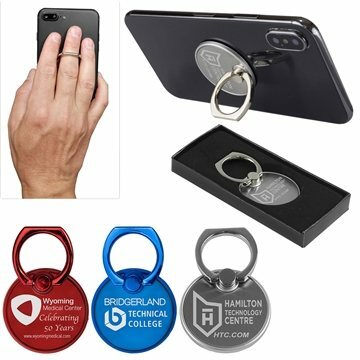 The Twister Cell Phone Ring from AnyPromo is a metal ring grip for the back of your smart phone and a phone ring stand. This metal smartphone finger ring features an adhesive backing that is easily removed and doesn't leave residue. Laser engraved on the front on an imprint area of 1 1/4" x 3/4". The Twister Cell Phone Ring Grip is a customer-voted "Top 100" item because it is so versatile. These phone grips not only help prevent you from dropping your phone, but can make it easier to hold for taking selfies and can be used as a phone stand for watching videos. If you worry about your cell phone slipping out of your hands, the Twister Metal Cell Phone Ring may be just the thing to give you peace of mind. Compatible with any smart phone, including Android and Apple devices. Convenient and safe metal ring grip prevents dropping and damaging mobile phones. Also enhances control of mobility while operating phone or taking pictures. Strong metal rotating ring also functions as a convenient phone stand for viewing videos, movies, playing music, reading the newspapers or books and more. Laser engraved imprint on matte metal center. Adhesive backing is easily removed leaving minimal residue. Slight shifting of imprint cannot be avoided when printing or Laser Engraving. Each product is manufactured and printed individually so up to 3/16” movement in logo printing alignment is acceptable and cannot be considered a defect. Products are intended for individual use and not for comparison to one another. Using a ring holder on the back of a phone not only makes it easier to hold on to and allows for easier one-handed use. Works as a stand when propped out so that the attached phone or media player can be viewed hands-free. Uses a high quality adhesive on the back that sticks well the first time and doesn't leave residue when removed. 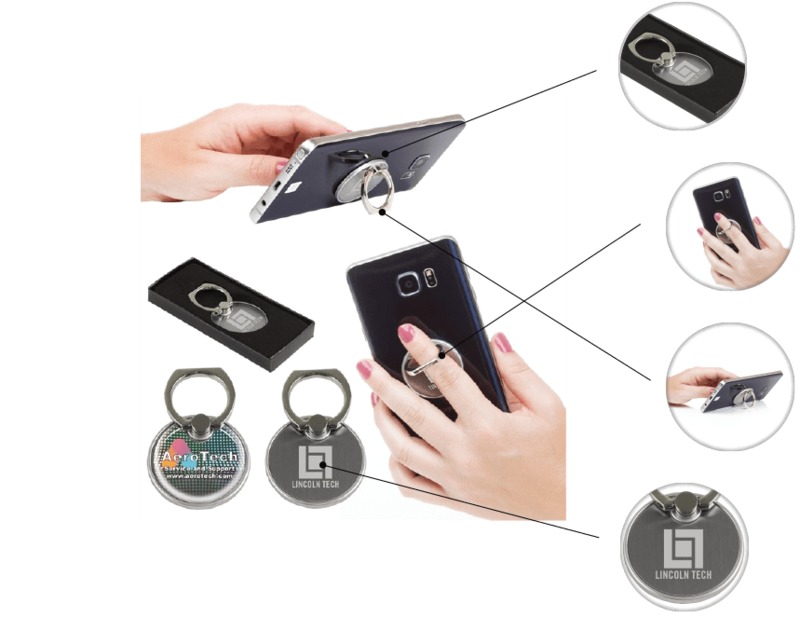 Smartphone ring is customized with a 1 1/2" x 2 3/8" Laser Engraving that gives this product a professional appeal. 1. Printing 1 color / 1 location only. 2. Epoxy dome, sand etch, personalization's and heat transfer are not available for 2 Day Rush Service. We use this as a training giveaway. The price point is perfect and the quality/print is spot on. My only complaint is that each item comes individually packaged with a lot of extra stuff. Too much trash! The Twister metal smartphone ring is a classy and functional phone stand and holder. I had been looking at another design, but was intrigued by this design. They turned out better than I could have hoped for. The price was unbeatable! They are beautiful, lazer engraved and individually packaged. I bought these for a housing fair and I love them! I put one on my personal phone and get excited about it every time I use my phone because, yes, I am a dork! Frosted Plastic Flexo Ink Multi Color Die Cut Handle Bag 9.5" X 14"